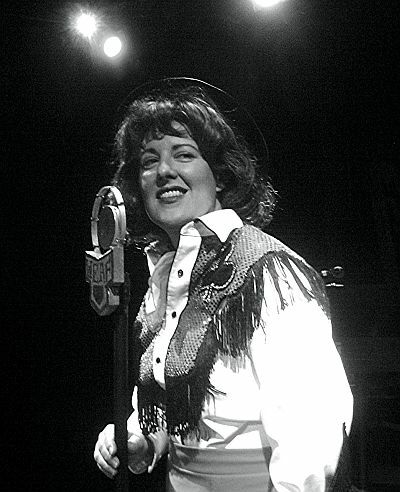 It must be ten years or so since the delightful night in New York when I took a visiting Texas friend to a little Off-Broadway theatre to see author, Ted Swindley‘s, “Always…Patsy Cline.” It was as though Miss Cline had been resurrected, right before our eyes, with a perfectly charming and very on-target vocal performance. Now, thanks to the show’s blissful revival from Texas Repertory Theatre, I was once again able to enjoy the illusion that I was in the presence of the great country music star who was so sadly taken from us by a tragic plane crash when she was only 30 years old. But the joy now continues with a wonderful performance in the title role by Julia Kay Laskowski, and it is easy to see why Texas Rep’s Associate Artistic Director, Steve Fenley, was bursting with enthusiastic pride as he stepped briefly on stage to introduce the show and the coming season for this growing company that the Houston Chronicle has called the “ultimate upstart.” A packed house on a Thursday night was just one indication that his pride was well-justified. Then it was on to the treasure chest of memorable Cline hits, now in the very capable hands of Laskowski. The show is structured around the true story of a friendship that developed between the star and one of her Houston area fans, Louise Seger, sweetly played here by Lyndsay Sweeney. Segar becomes the light-comic narrator of the piece as we hear the story of their friendship through correspondence and, more importantly, through the wonderful music that happily remains. All this plays out on a simple but effective Honky-tonk set (designed by the show’s director, Craig A. Miller). The fine Bodacious Bobcats band ( nicely led by music director, Patti Rabaza) sits high atop the little stage of the club, and the lighting designs of Jarrod Bainter pair well with a classic and colorful Wurlitzer juke box that reminds us of this bygone era. A foot-tappin’ overture from the band led nicely into a bright and sassy opener from our attractive brunette star as she launched quickly into, ”Honky Tonk Merry-Go-Round.” With bright smile, and smooth voice she moved on to a rich, inviting “Back in Baby’s Arms,” and then to an “Anytime” that was elegantly her own, even as it called sweetly to mind, Miss Cline. Reappearing in a scarlet cowgirl outfit (one of her numerous fine costumes from designer, Sonia Lerner), and under rosy lighting, Laskowski offered a sultry “Walkin’ After Midnight.” The two ladies share jokes and secrets (“A secret is no fun unless you tell someone.”) about experiences with marriage and divorce, and then the band offers smooth back-up for a warm and heartbreaking “I Fall to Pieces.” There were a few such moments when I felt the spotlight should be fully on Cline with her friend in the shadows, but overall, with a beaming sense of fun, the two work well together in creating the cheerful mood that pervades the story. In an extended scene of their first meeting at the Esquire Ballroom on Hempstead Highway, Sweeney plays the audience well for comedy, though I wished she did not work so hard at affecting a southern accent. Any doubts that Laskowski could capture the spirit of Cline were quickly put to rest by the exquisite “Sweet Dreams” that opened Act II, and that was followed with a smooth transition into “She’s Got You.” The gals have some cute comic bits during “Three Cigarettes in an Ashtray,” and then we have knockout performances of Cline’s classic looks at heartbreak in “Crazy,” and “Faded Love.” There was a lighthearted, “Seven Lonely Nights,” a tender and poignant, “Through the Eyes of a Child,” and spirit-filled numbers like, “Just a Closer Walk,” and “How Great Thou Art.” Sweeney even joins in the singing as the two team up for a fine duet of “Blue Moon of Kentucky.” A lively medley of “Gotta Lotta Rhythm” and “Shake, Rattle and Roll,” was followed by my parents’ favorite, “True Love.” A snappy encore of “Bill Bailey” was just icing on this very sweet cake, and sent the audience home for the inevitable sweet dreams. Perhaps Louise described Patsy best: “That country gal was a real winner!” The same can be said of Miss Laskowski. 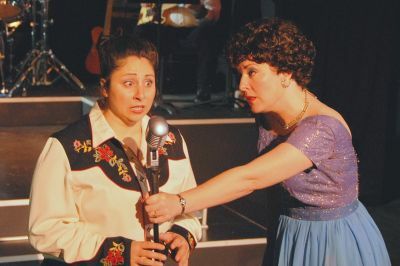 Performances of “Always…Patsy Cline,” continue thru July 29th at Texas Repertory Theatre, 14243 Stuebner Airline Rd. in Houston. For reservations and information call 281-583-7573, or visit the website at www.TexRepTheatre.org.